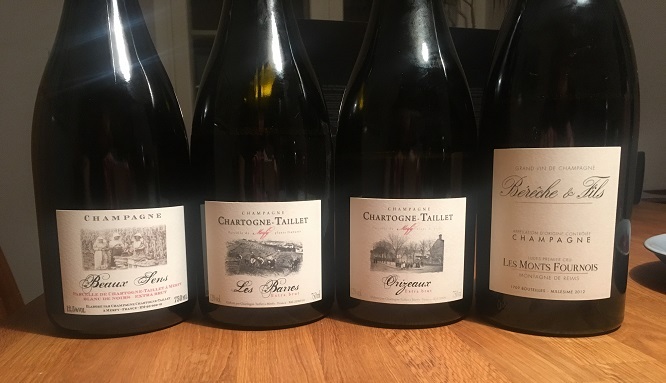 For a while we had been talking with a couple of friends about getting together to drink the new vintages of Chartogne-Taillet's superb single vineyard single variety wines Les Orizeaux (Pinot Noir) and Les Barres (Meunier). After agreeing on the date we then had to decide what else to open as two bottles for three persons is clearly too little. As I had developed a craving for Bérêche and my friend happened to have a bottle of the 2012 Les Monts Fournois - a 100% Chardonnay I was not familiar with - I dared him to bring that one. I then felt the urge to come up with something of similar caliber and as I had recently acquired a bottle of Chartogne-Taillet's 2013 Beaux Sens (Meunier) I found this the perfect opportunity to serve it blind, being the jokester that I am. My other friend who is a true Champagne fiend and has met Alexandre Chartogne on several occasions impressed us with her deductive approach and in the end she narrowed her guess down to "100% Meunier, Montagne de Reims, post-2010). Very impressive! That said her final guess was Jérôme Prévost, so there is still some more tasting and training needed, clearly. The average quality of these wines was ridiculously high. I consider both of them to be comfortably in the top-10 of all Champagne growers. The previous high point of my Champagne drinking path had been a dinner where we had all the 6 lieux-dits of Selosse and, while yesterday's wines are not as rare, based on purely vinous terms I do not really consider last night's experience a lesser one. Obviously 2012 is an extremely structured vintage and some might find the acidity overwhelming. I of course adore the acidity and salinity on both producers' wines and as such did not have any problems emptying my glasses with a wide smile on my face. For current drinking I think the 2012 Les Barres takes the cake but the one I would most want for my cellar is the 2012 Orizeaux. That said all four are undoubtedly fine wines that on their own would shine very brightly. In case you are wondering why the 2013 Beaux Sens does not state the producer's name I learned that starting from that vintage Alexandre wants the labeling to be all about the vineyard. I'm not really a fan of the decision but in the end it's what's in the bottle that counts. Very fruity, a bit creamy on the nose with notes of apple, cherries and orange peel. Incredibly concentrated on the palate, the vinosity levels are sky high here. A thick, thick wine of supreme confidence. While the two Meuniers (12 Barres and 13 Beaux Sens) already give a lot of pleasure this one is serious as hell and really built for the long haul. No ripe, lush red fruits on the palate, this is citrusy, saline, restrained and incredibly tangy. Extremely tense with such tightness to its finish that loud lip smacking is inevitable. Unforgiving yet awesome. Ripe, sweetish agrumes (think orange and blood orange) and spices on the markedly fruity and rather straightforward yet very inviting nose. On the palate bone dry, rich and ripe. Mouth-caressingly full-bodied with really good focus and a very delicious tangy edge to its fruit. Quite exotic in its expression, this is clearly more approachable than the 2012 Les Barres while still fairly savory and intense all things considered. A very complete, vinous Champagne that already is showing a lot while not being that demanding. It has a lot of flair and charm about it. Markedly smoky on the nose with a cocoa-like tone. Quite spicy as well with a hint of green chili. On the palate rich and thick, very generous and luscious. Spry acidity provides great juiciness and while being concentrated it is also very firm and poised. A true powerhouse of a wine with impeccable balance. Almost overwhelming at this point with its sheer mass and explosiveness but nothing short of mindblowing. Very vinous yet really savory and salty at the same time. A unique expression of Meunier and a Champagne of the highest standard. Seabreeze, crushed rock, tart lemon and lime all the way on the nose. Very fine and bright. On the palate likewise really tart and immensely intense but by no means underripe or under-dosaged. Bone dry with markedly high acidity - ultra chiselled. Primary as expected yet thoroughly compelling, exciting and energizing with a lovely saline finish. A bit challenging drink at this point no doubt and most certainly one for the cellar but already one cannot help but admire its through the roof electricity and the purity of its expression. What a wonderful post. Thank you, Ikka. These are wines I follow and buy, too. I just picked up another 1/2 case of CT, a mix of Orizeaux, Beaux Sens, etc. Not too long ago I finished my last bottle of 2008 CT Millesime, which I though was one of the best champagnes I had in 2018. I wish when I had the chance I would have purchased more of it, as it is really exceptional. Interesting on the Beaux Sens label to drop their name and let the vineyard be listed. I like it. What a great tasting and I love the idea on the whole. I've been wanting to do a comparison of single vineyard Chartogne-Taillets, but I seem to keep on drinking them before I get that chance. Do you have any more info on the Bereche? That looks to be a new cuvee to me (or at least one I haven't seen yet). It’s not like the name isn’t there. It’s just in red, right below the vineyard name. I was just doing a little cellar reorganizing, and ran across 2 bottles of the Les Barres from 2006. You're right, it's there in small red print. But quite a change from the previous vintages, isn't it? That's actually just what my friend said. Been drinking a ton of C-T yet never side by side to compare. I think this is a good time to hoard them while the availability (and price level) is still decent. 2012 is the inaugural vintage of Les Monts Fournois from Bérêche. Sourced from a lieu-dit on the northern end of Ludes with particularly thin soils over pure chalk, and a southern exposure planted with massale-selected Chardonnay in 1961. Fermented in barrel with native yeast and aged under cork. 3g/l dosage. I am not so concerned about label fonts. Thanks for the great post. I remember a few very good vintages of Cuvee Fiacre and would certainly like to have the opportunity for more, but I understand the impulse toward single vineyard/single grape. The 2008 Heurtebise is excellent, too.